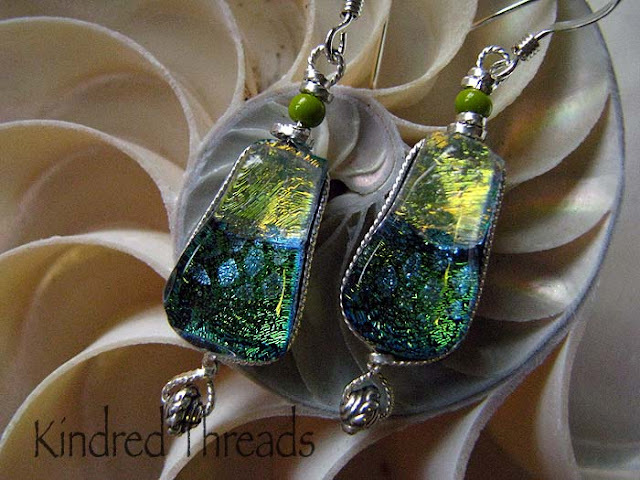 Dichroic glass beautiful, magical, unpredictable and a little addictive. 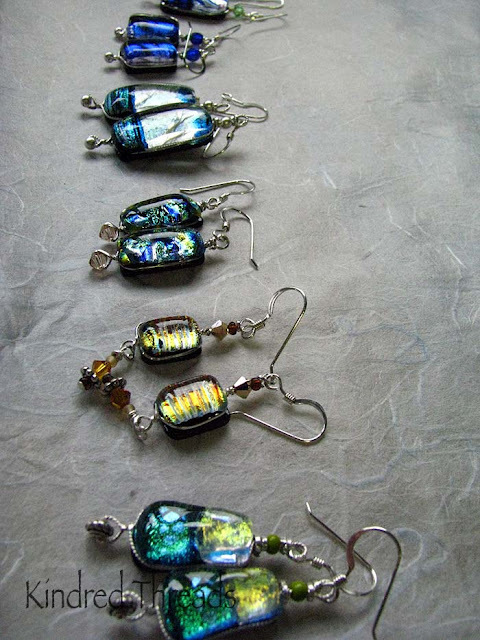 While taking a break from weaving I thought that I would go back to my stained glass beginnings and make some fused glass jewelry for the gallery. Should be a good time of the year for some jewelry sales. And since I actually sold a couple of pieces before they made it to the gallery; I think that I am encouraged. Two to three layers of glass waiting to be put through the kiln for the first time. 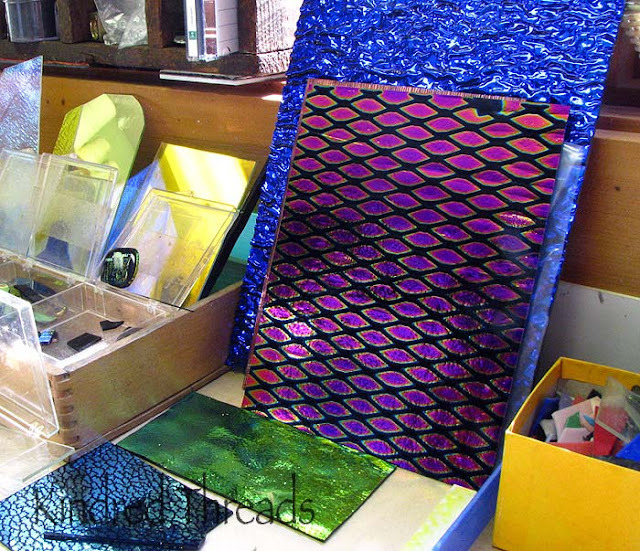 Fused glass is the process of taking multiple layers of glass and fusing them together. The glass is melted, in a kiln, at temperatures up to 1550 degrees. It usually takes several firings to achieve the desired effect. 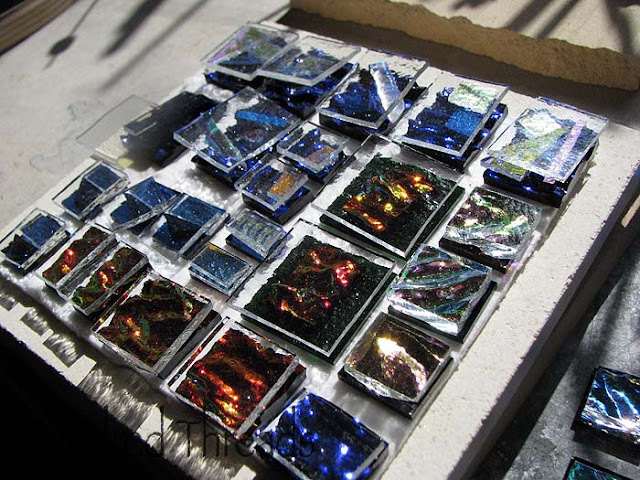 Dichroic glass contains multiple micro-layers of metal oxides. Layers of different metals (gold, silver), metal oxides and silica are vaporized by an electron beam in a vacuum chamber. (Whoa, way Buzz Lightyear). The vapor then condenses on the surface of the glass. The finished glass can have as many as 30 to 50 layers of these materials yet the thickness of the total coating is approximately 30 to 35 millionths of an inch. The coating that is created is very similar to a gemstone . The main characteristic of Dichroic Glass is that it has a transmitted color and a completely different reflective color. Furthermore, these two colors shift depending on angle of view. 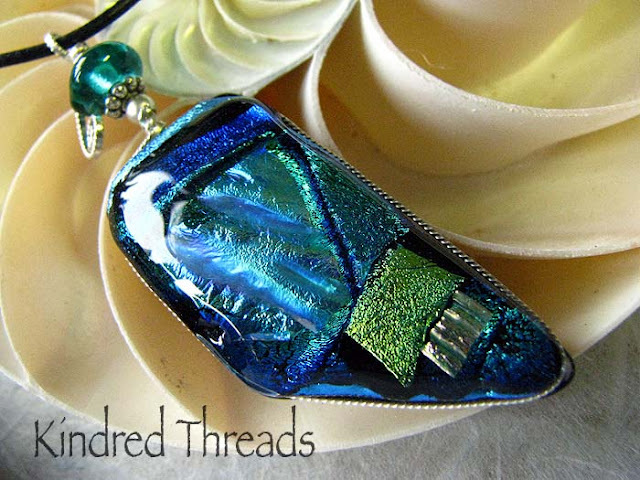 With the play of light together with its vibrant color, Dichroic Glass is absolutely amazing. My weak spot (well, one of them). Are they going on your etsy store? Do you post to Australia?? Seriously. Simply beautiful! I can see how making something so lovely could be addictive! 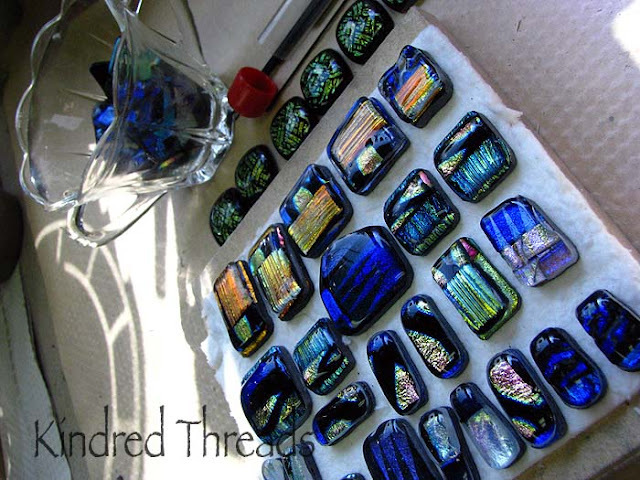 Is there a special kiln for glass work? Just curious as a friend has a kiln she uses for ceramics. Any kiln would work as long as the temp can go to about 1550 degrees for a full fuse and can hold the temp for 30 minutes at 980 degrees to remove the stress of cooling the glass. I use small jewelry kilns. And thanks for the compliments, these probably won't go on etsy till I see what sells at the gallery this season.